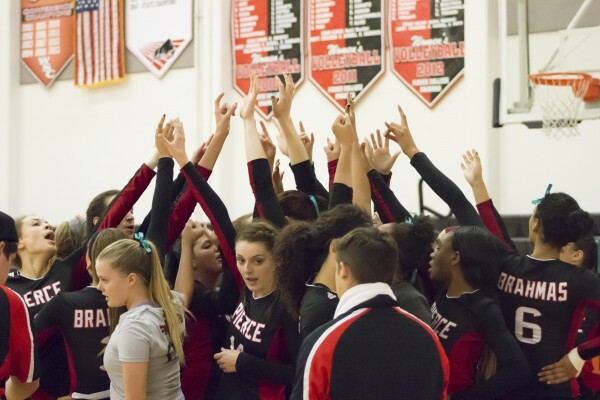 The Brahmas coming together after a time out during their match in the South Gym at Pierce College, Woodland Hills, Calif. on Sept 30, 2015. The Brahmas went on to win the game 3 sets to 0. After taking first place in the Pierce Brahma Invitational last weekend, the undefeated and number one ranked Pierce Brahmas faced off against Santa Monica College Corsairs with a record of 6-6. Head coach Nabil Mardini wanted his team to not take Santa Monica lightly. The Brahmas started off the first set with a 7-3 lead, but Santa Monica showed they were not intimated by keeping the score close throughout the first set. Santa Monica had their first tie in the set and forced a timeout by the Brahmas with the score 15-15. When the men’s basketball and baseball team walked in the gym, the energy in Ken Stanley Court grew immensely as they cheered on their colleagues. The Brahmas had support throughout the whole game with every serve and score. The support from the crowd proved to be beneficial as the Pierce Brahmas won the first set with a score of 25-21. The Brahmas opened up the first set with back to back aces from outside hitter Kristen White to take a 2-0 lead over Santa Monica, but the lead did not last long. Santa Monica continued to keep the score close throughout the second set, forcing the Brahmas to retake the lead at 8-7. The Brahmas did not look back, and won the second set with a score of 25-18. Santa Monica middle blocker Charlie Chiron De La Casinere got injured on the floor during the third set and did not return to the game due to Assistant Coach Jackson Metichecchia’s decision. “She said she wanted to come back, but I made the call and just didn’t want to put her in a questionable situation,” said Metichecchia. The Brahmas depth of players demonstrated to be an advantage over Santa Monica, as signs of fatigue were showing amongst the Corsairs in the final minutes. Without giving up a lead in the third set, the Pierce Brahmas remain undefeated after winning three straight sets over the Santa Monica Corsairs with the final scores of 25-21, 25-18, 25-13. Santa Monica Assistant Coach Jackson was proud with the way his team played. Despite not playing at their best, Pierce Head Coach Nabil Mardini was happy with the win. “We didn’t play great, but we found a way to win,” said Mardini. Defensive Specialist Kamala Lovick was also happy with the win despite the struggles the team had.